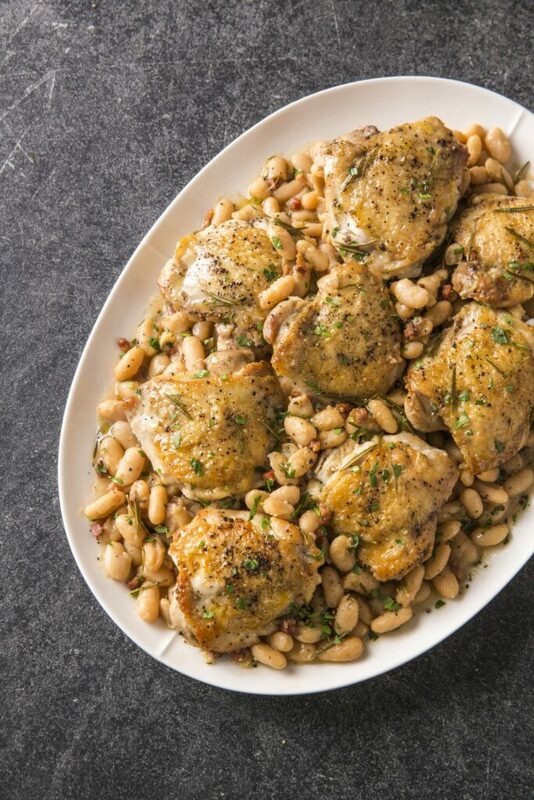 Braised Chicken Thighs with Pancetta, White Beans and Rosemary. Photo by Keller + Keller for America’s Test Kitchen. The Instant Pot has emerged as the must-have kitchen appliance of our age because it delivers meals much faster and with a far greater depth of flavor than more traditional cooking methods. But the Instant Pot is technically a multicooker because it can also be used as a crock pot, and the editors at America’s Test Kitchen – who produce the phenomenal Cook’s Illustrated magazine – think this fact has been ignored by too many for too long. 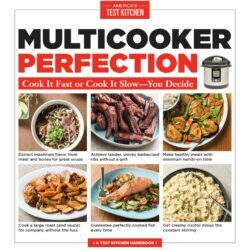 To remedy that they’ve produced a cookbook, “Multicooker Perfection: Cook It Fast Or Cook It Slow – You Decide,” stuffed full of recipes that can be produced using either function. Each recipe in this book contains one list of ingredients accompanied by two sets of instructions: one for the pressure-cook setting and one for the slow-cook setting. Admittedly I was eager to delve into the book, but not because of the prospect of finally unlocking the full potential of my multicooker. To be honest, I’ve owned an instant pot for months now and I’ve yet to use the slow-cooker function. I was excited because the recipes from the folks at America’s Test Kitchen are consistently awesome. The food in this volume did not disappoint. I tried three recipes: the Boston baked beans and the Boston brown bread, which I served together as a hearty, weeknight meal for the family, and the braised chicken thighs with white beans, pancetta and rosemary. I was particularly looking forward to the beans and bread, both of which take an entire day, if not days, to produce using traditional methods. The thought of being able to make them in an afternoon was intriguing, to say the least. Using the pressure cooker function, I tackled the beans first. Then I simply washed the pot and made the bread. Start to finish, the whole enterprise took about three hours. The beans were rich, creamy, and everything I’d hoped they be. The bread was even better. The chicken thighs were really something special. The meat emerged done to perfection and the beans were addictive: redolent of garlic, kissed by rosemary, and definitely under the influence of pancetta. I used boneless thighs because I had them on hand, even though the recipe calls for bone-in chicken. We liked the dish so much I made it again, the second time using the bone-in pieces. The boneless version was good; the bone-in version was great. The kids even asked to have the leftovers for lunch at school the next day. Confession: I still haven’t tried any of the recipes on the slow-cooker settings, and I may not; slow cooking is not this appliance’s strong suit, something even the Test Kitchen editors acknowledge in their introduction. That said, “MultiCooker Perfection” is a gem. In addition to the dozens of recipes, you’ll find solid advice, supported by exhaustive research and testing, about how to get the absolute best out of your Instant Pot. Add pancetta, garlic and ¼ teaspoon pepper to fat left in multicooker and cook until garlic is golden and pancetta is crisp and browned, about three minutes. Stir in beans, water and rosemary sprigs. Nestle chicken, skin side up, into multicooker, adding any accumulated juices. To pressure cook: Lock lid in place and close pressure release valve. Select high pressure cook function and cook for nine minutes. Turn off multicooker and quick-release pressure. Carefully remove lid, allowing steam to escape away from you. To slow cook: Lock lid in place and open release valve. Select low slow cook function and cook until chicken is tender, two to three hours. (If using Instant Pot, select high slow cook function and increase cooking time to four to five hours.) Carefully remove lid, allowing steam to escape away from you. Transfer chicken to serving dish and discard skin, if desired. Tent with aluminum foil and let rest while finishing beans. Cook beans using highest saute or browning function until liquid is thickened slightly, about three minutes. Discard rosemary sprigs. Stir in parsley and season with pepper to taste. Drizzle individual portions of beans with extra olive oil before serving with chicken.